I’m super psyched to be back at writing and getting back into the brewing community. Sadly, I’m still working the nights of the Winnipeg Brew Bomber meetings so I don’t get to attend those, but if you have any interest in learning about home brewing or connecting with a group of incredibly knowledgeable and talented individuals, I’d recommend considering this group. Today I’m going to write about three beers from Surly that have arrived in Manitoba and are currently available. Two which will be consistently available along with Todd the Axeman, Xtra-Citra, a Citra centric American pale ale, Furious IPA and a seasonal release Surlyfest. These are all available at Liquor Marts and many beer vendors including Quality Craft Beer Store, Econolodge and St. Norbert Hotel. Xtra-Citra is an American style pale ale that uses warrior hops for bittering and then a load of citra to bring big tropical citrusy notes to this highly drinkable beer. The APA is a modern American craft beer adaptation of the English pale ale. These beers tend to reflect ingredients that can be sourced by the brewery locally. While these beers are an American craft beer invention, the desire to source locally means that this Italian version will hopefully have a little bit of that old world flare. Prior to the explosion of popularity of the IPA, the American Pale Ale was the most well-known and popular of the American craft beer styles. Without further ado, time to taste the beer. Appearance – Pours a slightly haze pale golden yellow with a nice white head. Smell – Citra hops notes are the most prominent on the nose. Lots of grapefruit and orange notes, passion fruit, some funky wet-hop notes and some cattiness on nose as well. Taste – You get notes of orange-peel and lemon, faint resinous grapefruit a bit of malt sweetness. The taste on this is dialed back a bit leaving a softer hop bitterness and Citra-centric flavour. Mouth Feel – Light body with a nice carbonation and a soft bitter finish. Overall Thoughts – Despite being a bit of a softer hop centric pale ale, the flavours that it brings are nice and, if you like Citra, this beer brings those notes. Overall an enjoyable and easy drinking pale ale. Do I like it? – Xtra-Citra a nice quaffable beer that still brings nice hop notes. I do like this beer and it’s a good balance to the higher more hop forward offerings from Surly. While IPAs are part of the pale ale family, they are strongly hopped and often highlight the variety of flavours and complexities that can come from the simple ingredients used to brew beer. Many will say the IPAs are an acquired taste, and they are rather unique, the bitterness brought using a large quantity of hops is not for everyone. On most IPAs you’ll see an IBU (international bitterness units) number that gives you an idea of how bitter it might be. For comparison, Torque’s American Pale Ale (Foundation) comes in at 30 IBUs, Half-Pints little Scrapper comes in at 50, and Barn Hammer’s Saturday Night Lumberjack at 75 IBUs. Surly Furious is an amber hued IPA using a variety of hops working in tandem with a sweet malt backbone to balance against the pretty intense 99 IBUs of hop bitterness. Appearance – Pours a slightly hazy amber with a nice foamy head that leaves lacing on glass. Smell – Definite citrus notes as well as some more prominent piney notes and caramel malt. Taste – Bitterness from the hops brings a nice citrus note on front that is quickly blended with the sweetness from the malt. The finish brings nice pine and resinous notes that leave a lingering bitterness on tongue. Mouth Feel – Medium bodied with good carbonation and a lingering bitterness. Overall Thoughts – Well balanced IPA bringing good aromas and flavours from the hops. The pine notes combined with the citrus bring a nice hop bitterness that makes this beer a nice IPA that is still drinkable. Do I like it? – Yes. I think this is a nice IPA that brings a different take on the style from Todd the Axeman. This one brings a bit more variety in hop notes and will certainly be on my IPA list. Proving that they like to do things differently, Surlyfest is Surly offering for the Oktoberfest season. This is a beer that is now in its 10th anniversary and is a really unique offering for the fall beer season. Surlyfest is a lager that has been brewed using three types of rye malt and then dry-hopped with a single variety of American hop (Sterling in this case) to bring some really nice spice flavours along with the floral hop notes of sterling. This beer falls under the category of a Märzen. Before refrigeration, it was nearly impossible to brew beer in the summer due to the hot weather and bacterial infections. Brewing ended with the coming of spring, and began again in the fall. Most were brewed in March (Märzen). These brews were kept in cold storage over the spring and summer months, or brewed at a higher gravity, so they’d keep. Märzenbier is full-bodied, rich, toasty, typically dark copper in color with a medium to high alcohol content. While certainly not a traditional Märzen, Surlyfest brings an interesting interpretation on the style and provides something different. Appearance – Pours a clear deep copper colour with a tan head. Smell – Interesting aroma. You get some dark bread and caramel along with some subtly spicy and peppery notes a floral note from the hops. Taste – Nice notes of bready malt, caramel and that subtle spice and pepper coming through from the rye. The hops bring a touch of citrus and bitterness that doesn’t really overtake anything but provides another layer. Overall Thoughts – While not the traditional Märzen that we see around Oktoberfest, we knew that going in. This beer is a delicious take on the traditional and the use of three different rye malts really brings an interesting character. Do I like it? – Absolutely. This beer really makes use of the rye malt and sterling hop to bring an interesting and tasty take on the traditional. Not your dad’s Märzen, but it should be. Thanks for reading as usual folks. I’ve got plans to get back into Get to know a brewer soon. I’m also looking to sit down with those breweries open for one year to get their insights starting with Torque. Also hoping to sit down and get some follow-ups done with breweries yet to open their doors. Keep following along, it should be a fun year. Today’s beer is a special one. 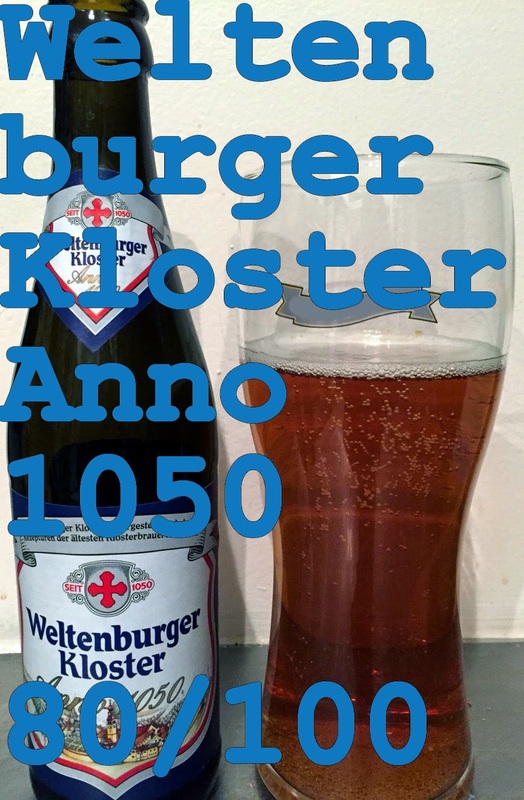 It comes to us from the Weltenburg MonasteryBrewery in German and is called “Weltenburger Kloster Anno 1050.” For those who may not know, the Weltenburg Monastery is the oldest monastery brewery in the world and the second oldest brewery. The main reason for the popularity of the Weltenburg Abbey Beer is due to the high art of brewing: they follow the brewing tradition of the Benedictine monks and also must follow the Bavarian purity laws. Bavarian Purity Laws were established in 1487 when Albert IV, Duke of Bavaria promulgated it. The law specifies three ingredients – water, malt (barley) and hops – for brewing beer. The law was established to make eliminate competition between brewers and bakers for rye and wheat. Limited the grain to barley they made certain that there would be affordable bread for citizens. The law was replaced by the provisional German beer law in 1993 which allowed other ingredients such as yeast, wheat malt and cane sugar, but would no long allow unmalted barley. One of the reasons yeast was never included in the original text is it wasn’t until the 19th century that Louis Pasteur discovered the role of microorganisms in fermentation. While the change from the original law allowed for brewers to use different ingredients, many German breweries still follow the original law and brew using the strict method laid out within it. Weltenburger Kloster (Weltenburg Monastery) is one of those breweries. Before refrigeration it was nearly impossible to brew beer in the summer due to the hot weather. Brewing ended with the coming of spring and most beers were brewed in March (Märzen). These brews were kept in storage until the end of summer where they’d be brought out and served with the remaining bottles served at Oktoberfest. Because of this tradition, it has become a beer associated with the Oktoberfest. The beer we are trying today is called a Märzen beer. This style of beer originates in Bavaria around the 16th century and is also known as an Otoberfest beer. The style is characterized by a medium to full body, malty flavor, and clean dry finish. I’m excited to try this one. Let’s get to the beer! Appearance: Clear, medium copper amber colour that pours with about two fingers of head which dissipates leaving a thin cap. Smell: caramel malt, floral notes from the hops. Taste: Honey sweetness with hint of lemon and just a hint of bitterness on the finish. Different than other similar style beers but still very tasty. Mouth feel:.Coarse mouth feel, medium body, perfect carbonation. Overall: A very tasty brew overall. Excellent flavors that meld perfectly together to give you a really fresh, crisp and refreshing beer. This would be the perfect summer beer. Do I like it: I very much liked this beer. It is different than what I would normally seek out, one of the reasons I love this calendar. The flavor profile of this beer is just fantastic. It is sweet and smooth while at the same time being crisp and refreshing. The sweetness is not overwhelming but rather a good compliment. Very good beer from this, the second oldest brewery in the world!